In many ways, it seems surprising that Sarah Kane's 1999 play 4:48 Psychosis had not received a contemporary operatic treatment before Philip Venables' 2016 opera based on the play. Kane's play, with its language varying between the highly abstract and the poetic, and flexible in form without specific characters or narrative, seems to almost have music embedded within it. Venables has taken Kane's text and set it for six female singers and instrumental ensemble, to remarkable effect. 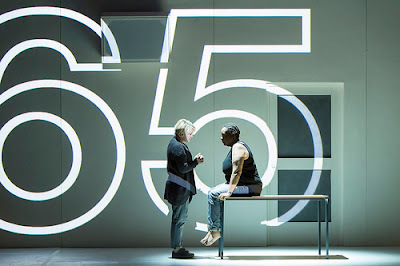 The Royal Opera House's production debuted at the Lyric Hammersmith in 2016 and has been revived (seen Saturday 28 April 2018). The six singers were Gweneth-Ann Rand, Lucy Hall, Susanna Hurrell, Samantha Price, Rachael Lloyd, and Lucy Schaufer, with Richard Baker conducting Chroma. The director was Ted Huffman, the designer Hannah Clark with lighting by D.M.Wood, video by Pierre Martin, sound design by Sound Intermedia and movement by Sarah Fahie (revived by RC-Annie). Kane's text moves between a very subjective presentation of depression, providing specifics such as dialogues with healthcare professionals, deciding whether to take medication, the desires of the depressed mind, the effects and effectiveness of medication, self-harm, suicide and the possible causes of depression, but there are also other more abstract scenes on subjects such as isolation, dependency, relationships, and love. Each incarnation of the play articulates these differently, so Venables opera gives us one particular arc through. The six singers were identically dressed and often formed a group, the idea of six different incarnations of the same mind perhaps, with a hint of the fracturing that clinical depression can bring. But there were differences too. Lucy Hall, Susanna Hurrell, Samantha Price and Rachael Lloyd formed a clear visual group, all sporting mid-to-dark hair in a pony-tale and these acted sometimes as a type of chorus, with Gweneth-Ann Rand clearly as the protagonist and Lucy Schaufer as a series of professional and psychologist figures. 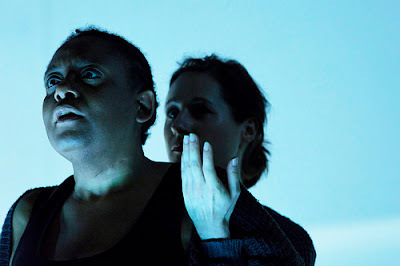 Venables stretches naturalism even further as, for Kane's scenes which are more obviously patient/healthcare professional dialogues, these are not explicitly set to music but the words projected accompanied by the two percussionists, creating a setting at one remove. These were staged as a mime and proved enormously effective with both Schauffer and Rand conveying the wealth of emotion underlying the bald text. Given the subject matter, and the extreme violence implied sometimes in the text, Venables' music was surprisingly rich, varied and often contemplative. He has risen superbly to the challenge of writing for six female voices and created some striking musical textures. Taking a fluid approach to text setting, so that the vocalisation varied from whispered to spoken to sung, and passing phrases between voices, his writing implied a knowledge of former ages polyphonic techniques without ever being either slavish or imitatory. And the instrumental writing was similarly varied. There were moments of violence, moments of great intensity and power, but the musical setting did not have the strident insistence that I had feared, given the subject matter. The piece lasts 90 minutes or so without an interval, and Venables' pacing was excellent, leading us through and never seeming to lose either the underlying dramatic or architectural thread. We started with Gweneth-Ann Rand alone on stage, then joined by her five avatars, and at the end, we were left with her alone. 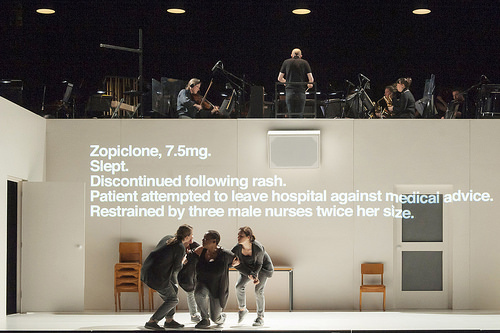 The space was a simple white room, evoking the many such rooms in hospitals and healthcare venues, but above was the orchestra. A very neat touch, making communication with conductor Richard Baker at least possible, and suggesting that the orchestra was also evoking another strand of the protagonist's mind. The performances were superb. Each singer gave a finely concentrated performance yet each was part of a whole, sometimes voices came forward and sometimes they retreated. Gweneth-Ann Rand's performance as the protagonist with profoundly moving and heroic, with Lucy Schauffer devastating as the psychologist/healthcare professional figure who always tries to keep distance (and in one memorable scene fails to do). But each singer in the six gave a devastating performance. Richard Baker did a sterling job coordinating this fascinating soundworld which mixed six live voices, recorded sound and the instrumental ensemble (flute/piccolo/alto flute, three saxophones, accordion, piano/synthesizer, two percussionist, viola/violin, two violas and bass), with its rather distinctive instrumental line-up. Venables has a fine ear for instrumental and vocal timbre, and the writing for both voices and instruments was richly sophisticated and varied. 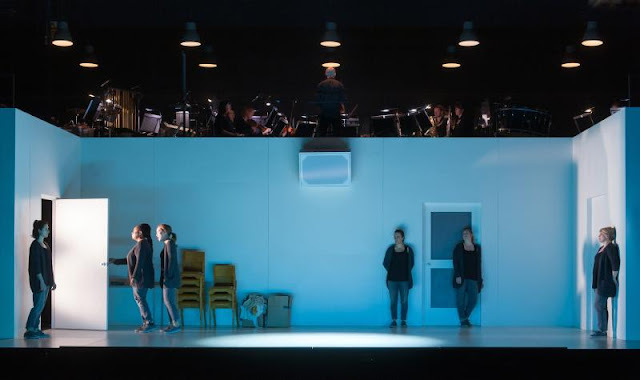 The effect of this piece was far more than just a musical back-drop to Kane's play (as can sometimes happen in contemporary opera), and Venables music provided a striking new dimension. It would certainly be a piece which would reward listening to again on CD. The cast's diction was good (thankfully, because the height of the proscenium meant it was a long stretch to look up to the surtitles). I want to hear this piece again, in another venue and do hope that the Royal Opera House might consider mounting it in the Linbury once it is re-open.